Happiness is a very transient feeling. You may be happy with your team winning a Superbowl. You may be happy with the love of your partner. You may be happy because you have a dream job. I am happy because I have a couple of these things. But also because Leif is just a great dog. He is, at this very moment sunning himself outside in my back yard. He loves the sun, he comes to me occasionally warm, soft and not a little dusty. It is the last week of January and warm enough for my crazy guide dog to sun bathe. There are times when working Leif can be a frustration. He is very intelligent and quick to pick up on my moments of distraction. But when we get to work together in harmony then it is the most wonderful experience. Working with a dog so closely is one of the greatest causes of happiness in my life, did you notice Life is an anagram of Leif? Many guide dog users talk of a life changing bond between themselves and their dog. As we come up to our three month anniversary, I can really see this bond developing. 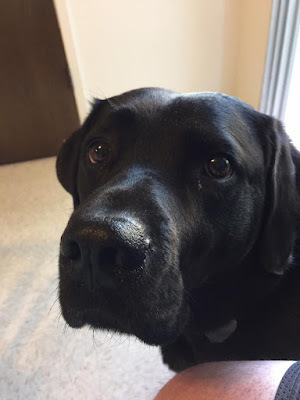 For me then today, happiness is my wonderful wife, my great job and a short black Labrador Retriever named Leif. My guide dog.